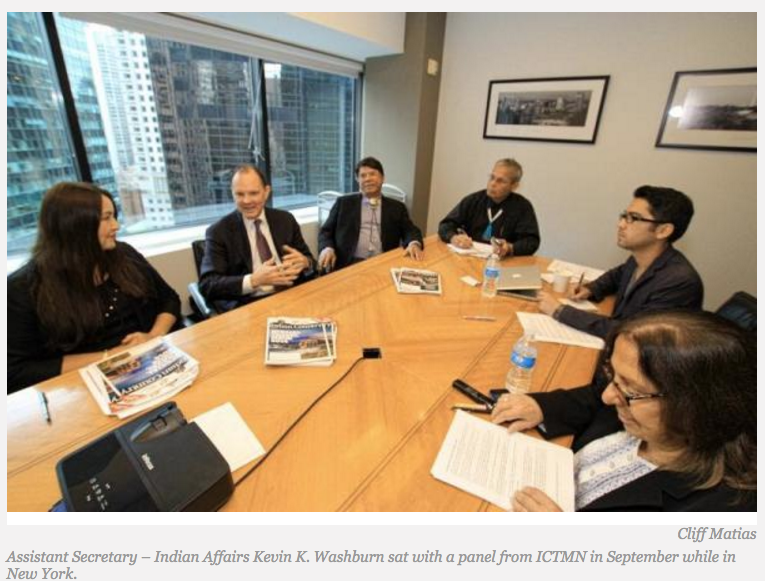 ICTMN's panel consisted of Ray Halbritter, Publisher; Gale Courey Toensing, staff reporter as moderator; Ray Cook, Opinions Editor; Valerie Taliman, West Coast Editor; and Simon Moya-Smith, Correspondent. All participants asked questions at various points in the conversation (photographer Cliff Matias, a resident of Hawaii, chimed in at one point as well). Christopher Napolitano, Creative Director and Nedra Darling, director of Public Affairs for the Assistant Secretary — Indian Affairs were also present; Rob Capriccioso, DC Bureau Chief, who was unable to attend, provided questions in advance for Toensing to introduce.